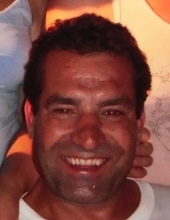 Manuel Caravela Da Silva, 54, passed away suddenly, on Friday, November 16, 2018 at Chilton Medical Center in Pompton Plains, NJ. He was born in Torreira, Portugal and came to the United States in 1973 and resided in Newark, NJ. Manny worked for Concrete Construction Corp of Hackensack, NJ for many years and was a member of the Heavy and General Conctruction Laborers Local 472 of Newark. Beloved son of Laura Caravela Da Silva and the late Manuel Da Silva; dear father of Danny Da Silva; brother of Fatima Baptista, Idalina Pereira, Rosa Lesmes, Laura Da Silva and Jack Da Silva; also survived by many dear nieces and nephews. The Funeral Mass for Manny will be offered on Wednesday, November 21, 2018 at 9:30am at St. Aloysius Church, Newark. Cremation Private. Relatives and friends are welcome to attend. The visitation for Manny will be on Tuesday, November 20th from 6– 9 pm. To send flowers or a remembrance gift to the family of Manuel Caravela Da Silva, please visit our Tribute Store. "Email Address" would like to share the life celebration of Manuel Caravela Da Silva. Click on the "link" to go to share a favorite memory or leave a condolence message for the family.